This popular striped jumpsuit is back in stock in all sizes. This cute ruffle top is on sale for $27. These are great classic shorts that come in 16 colors - and are 40% off! I love these printed drawstring shorts are 40% off. A classic button down like this one never goes out of style - and this one is 40% off. I like these drawstring safari shorts - I just might order them for 40% off. These earrings make a statement and are marked down even more! These cute scalloped shorts in white are on sale! These popular Tory Burch sandals are a great deal. These cute sneakers are marked down a little. Have you seen this cute yellow striped off the shoulder dress - for under $50! This comfy pink sweatshirt is still available - and only $23. I love the color of these cropped dress pants - that are 40% off. Turquoise and white is so so pretty and Summery! Have a wonderful Wednesday beautiful! I love turquoise and white together! Reminds me of the ocean. That ruffle top is so pretty! I think of the ocean too - a calming color combo! I have MANY words like that, I am an awful speller! I love torquoise and white, so pretty. I've been looking for some white shorts...but can't wait to see what your new favorite jeans are! 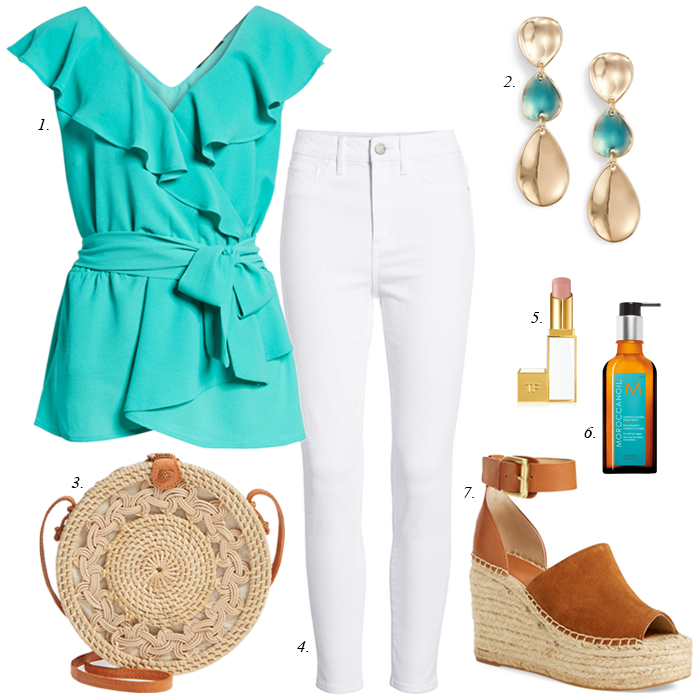 I love turquoise and white, too, and I agree with the combination just screaming Summer! Thanks, Laura! I just feels like a summer vacation. Oh I just love this whole outfit! The color pairing is perfect summer! And no, I've not tried Moroccan Oil (auto correct had to help me with Moroccan - I put 2 'r's). I could totally see you in this color combo - you would look great in it! Loving your picks so much! Great taste babe. Pretty outfit! I really want a straw bag but need a bargain basement version! Will keep looking. My daughter uses Moroccan Oil on her hair. Swears by it. I am all about fragrance so knowing it smells good sold me on it!